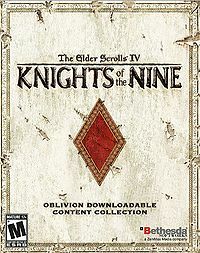 Knights of the Nine is an official download for Oblivion, revolving around the titular order as they recover the lost relics of the Divine Crusader. A list of frequently-asked questions and their answers can be found on the FAQs page. Creatures — Two entirely unique types of creatures are introduced with the download, while two others are new variations of existing creatures. Items — Items introduced with the download include new armor, books, jewelry, and weapons. Magic — Eight blessings, four curses, and five powers are included with the download. NPCs — Over 30 new NPCs are introduced with the download, many of which are aligned with The Knights of the Nine faction. Places — 8 new locations are included with the download, while a number of existing locations are altered once the download has been installed. Quests — 11 quests are added to the game by the download, all following a main questline. Nine Divines — The cult who worship the Nine Divines, largely consisting of people who work at the chapels across Cyrodiil. This faction exists without the download, but cannot be joined unless Knights of the Nine is installed. When you begin Pilgrimage, after speaking to the Prophet, you are given the rank of Pilgrim in this faction. Membership in this faction allows you to freely enter all areas within chapels (including undercrofts and living quarters). Knights of the Nine — An order devoted to recovering the relics of the Divine Crusader, Pelinal Whitestrake. As you progress through the quests, your rank in the Knights of the Nine faction changes. At the start of The Shrine of the Crusader quest, you become Knight Errant. After obtaining the Cuirass of the Crusader during the Priory of the Nine quest, you become Knight Commander. At the start of the Umaril the Unfeathered quest, you become Divine Crusader. Completing the Knights of the Nine questline will require you to abolish your Infamy. The variety of items, powers, and services rewarded from completing the quests may be particularly useful for new characters. You can only equip the Relics gained in the quests if your infamy is 1 or less. If your infamy ever reaches 2 or more, you must repeat the Pilgrimage to a Wayshrine of every deity. Items and effects that temporarily increase your Infamy, such as the Gray Cowl of Nocturnal will make you unable to equip the Relics until you unequip the items or the effects wear off. Unlike other official downloads, Knights of the Nine introduces new dialogue into NPC interactions throughout the entire game. For instance, after several of the Crusader's Relics are claimed, NPCs will mention them in rumors and in conversations with other NPCs. Similarly, by completing the questline, NPCs will sometimes refer to you as a Holy Knight or Divine Crusader. If your infamy rises above 0 after completing the questline, NPCs will sometimes greet you saying: "I used to think you were a hero. A holy knight and all that. I guess I should have known better." or "I used to admire you. But it turns out you're just a sinner like all the rest of us."